Lionsgate and CBS Films have released a first look at their feature adaptation for the late Vince Flynn's long-running series that centers around character Mitch Rapp. While I haven't personally read any of Flynn's novels there are apparently a lot of people who do. Each one of Flynn's fifteen (fifteen!) novels that are set in the world of counter terrorism and feature Rapp have been a New York Times best-seller, the three most recent entries having gone to number one, with the series as a whole having sold nearly 20 million copies to date. While we're on the subject, it seems American Assassin is actually the eleventh book in Flynn's series, but the first chronologically. This makes sense as to why the studio would then cast Dylan O'Brien in the lead role at the ripe old age of twenty-five as they are no doubt hoping this film might potentially kick-off a profitable franchise for them. 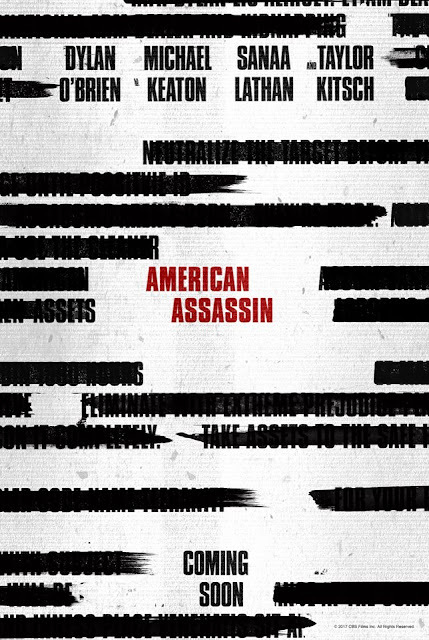 All of that taken into consideration, this teaser for American Assassin is quite terrific and promises everything one could hope for from a piece of genre filmmaking like this. Director Michael Cuesta made one of the more underseen investigative procedural's and all-around underrated films of three years ago with Kill the Messenger and with the tone of the story he's working with here as well as an screenplay adapted by the likes of Michael Finch (Predators), Marshall Herskovitch (The Last Samurai), Stephen Schiff (The Americans), and director Edward Zwick (Blood Diamond) it would seem Cuesta might be able to bring that same sense of urgency, suspense, and intrigue that he did with his last feature. Here's to hoping this is more along the lines of Christopher McQuarrie's Jack Reacher than that of Zwick's lackluster sequel from last year. American Assassin also stars Michael Keaton, Sanaa Lathan, Shiva Negar, Taylor Kitsch,and opens on September 15, 2017. Synopsis: AMERICAN ASSASSIN follows the rise of Mitch Rapp (Dylan O’Brien) a CIA black ops recruit under the instruction of Cold War veteran Stan Hurley (Michael Keaton). The pair is then enlisted by CIA Deputy Director Irene Kennedy (Sanaa Lathan) to investigate a wave of apparently random attacks on both military and civilian targets. Together the three discover a pattern in the violence leading them to a joint mission with a lethal Turkish agent (Shiva Negar) to stop a mysterious operative (Taylor Kitsch) intent on starting a World War in the Middle East.